Frost bite can easily happen if any of the skin is left exposed during the winter months and when temperatures may hover at -50 to -80 degrees. In these conditions even a quick run up to the post office, can be dangerous. For that reason all buildings have porch areas for changing clothes: dressing up for the outside, or taking off for the inside, which can be warm and centrally heated. Ready for a snowmachine ride mid winter. Everyone takes the cold seriously. Small children are adept at storing their mittens and hats down the sleeves of their parkas when they hang them up. Children leave their heavy boots on inside in case of fire, when there may be no time to change quickly into warmer clothing necessary for outdoors. 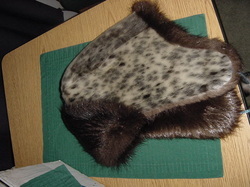 Closeup of the lining for a quspuk showing rabbit and wolverine fur. 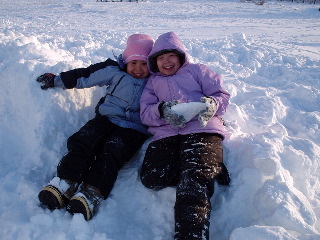 Children think nothing of playing outside in - 20 degrees. Traditional quspuks are often worn inside. 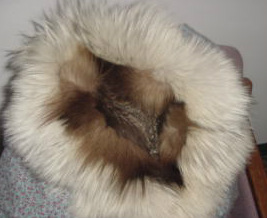 Sometimes rabbit fur is worn underneath the quspuk, fur against the skin, to keep the body extra warm. 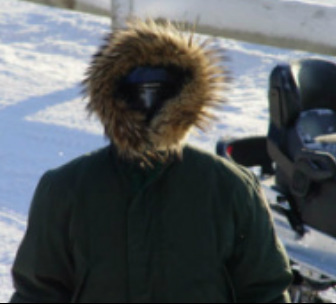 Wolverine ruffs are usually worn around the face as they do not freeze. A variety of furs are used in traditional clothing, and are dependent on the skills of the hunter, and the adeptness of the sewer. Furs can be a symbol of status. 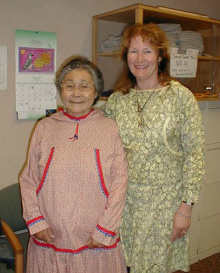 This elder is wearing a quspuk she has made. 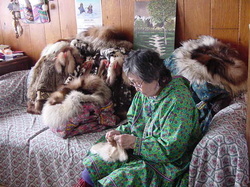 Elders can sew quspuks to fit simply by looking at the person to gauge the dimensions. A spotted seal hat, excellent for keeping the head and ears warm.